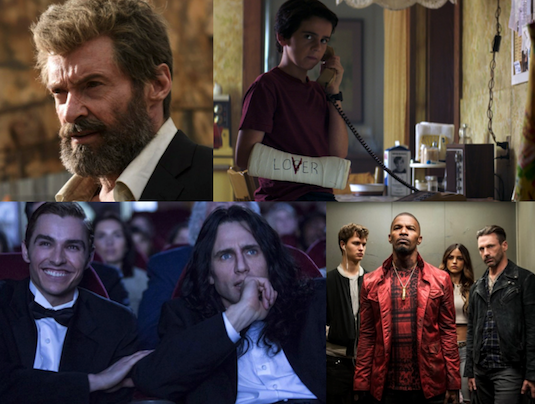 If you take a look at my most anticipated list from last year, than you'll see there were certainly some movies that I was a tad overly enthusiastic about. But the beauty of it is, this list is comprised of a majority of films I would've have never expected to like as much as I did, some of which I hadn't even heard of at this time last year. Now keep in mind these might not all be the most critically praised films of the year, but they're the ones I felt had the perfect combination of being greatly made films along with being entertaining ones. I missed out on a lot of movies this year, so chances are that if there's a movie you're surprised not to see here, its probably because I haven't seen it yet. With that disclaimer aside, without further ado here are my personal top ten movies of the year 2017. I have to admit, I was one of those guys who strictly based my perception of M. Night Shyamalan by his work on The Last Airbender. But after seeing his old work, I've truly come to appreciate him as a creative visionary who just doesn't always get it right. Well with Split, he got it right. Specifically by casting the talented James McAvoy to play all these different personalities. McAvoy is able to go from such a sinister and horrifying character to an innocent little boy in the blink of an eye, and that just makes the character all the more terrifying. Like with some other movies on this list, the final act isn't exactly as good as it should've been. But the last scene connecting the movie to Shyamalan's Unbreakable was a great twist, and opens the door for an extremely exciting and different type of superhero universe than we've ever seen before. If there's one thing Spider-Man: Homecoming proved to me, its that Tom Holland is a perfect Peter Parker, and just the guy to bring the character into the MCU. I might be one of the few who has loved every actor who has played the role so far, but Holland really feels like a small time crime fighter just trying to make it big as a hero while also being a genuine kid dealing with high school problems. None of the kids in this movie feel like adults playing high school students, and thats a huge plus that makes this feel like a coming of age story for Spider-Man. While it doesn't exactly feel as much like a Spider-Man movie as I wish it would've because of the changes from the source material and abundance of MCU references, I love that its a new take a character we've seen so many times. Plus Michael Keaton made just as great of a villain as I thought he would. I would've never expected to enjoy a Thor movie this much, and I'm so happy I did. I was cautiously optimistic about this movie, especially after how much I hated Thor: Dark World. But thanks to director Taika Waititi, the Thor franchise got the much needed revamp and went in a completely new direction with both its tone and setting. Everyone from the ensemble cast including Chris Hemsworth, Tom Hiddleston, Tessa Thompson, Mark Ruffalo, Jeff Goldblum, and Taika himself are fantastic. Its honestly the most fun I had at the movies all year, and really just finally made Hemsworth's Thor as likable as he should be. While there are some flaws with just how serious the film's events of Ragnarok are actually taken amongst all the humor, as well as Cate Blachett's Hela falling short of being a real iconic threat, I had a blast watching this movie. I have to admit, I think I was one of the few people who had my eyes on Get Out since last year. As a huge Key and Peele fan, I was surprised to hear Jordan Peele was going to go solo and try his hand at directing a horror movie. While I'm glad he did. Peele managed to bring us such a creative and iconic horror movie that will be remembered for generations. Yet some how in the midst of it all, he still managed to inject some humor throughout the movie and make Daniel Kaluuya's character likable and easy to root for. You literally want this dude to get the hell out of there. The movie takes some very unexpected twists that really caught me off guard, and had me on the edge of my seat until the film's finale. Coming of age smaller budget films have sort of become my thing for the last couple of years, and have been a nice break from superhero blockbuster fatigue. Lady Bird is just the type of movie I was looking for, with characters and situations that couldn't feel more genuine and real. I managed to care about just about every character Lady interacts with in this movie, and thats not something that can be said for most movies. While the plot isn't the most structured or clear for the viewer, thats part of what makes it feel so authentic. Take it from a guy who left high school not too long ago, this movie is more relatable than I would've thought a movie about a rebellious teen girl at a Catholic school would be for me. The twists and the way people come and go from Lady's life, along with the spectacular acting and dialogue contribute to this sense of realism Greta Gerwig was able to capture. As someone who lives in Florida and has been to Disney World several times, I've actually learned a little bit about what goes at the motels in the area. Director Sean Baker did a great job capturing the innocence of these young kids who live at the hotel, specifically with the main character Moone amongst all the terrible things going on with the adults they live with. While the film doesn't have much of a plot, you're too entertained with these characters who feels like real life people. Even though throughout the movie only minor things happen to them, you become so attached to the characters that every single thing obstacle they face feels personal. The combination of newcomers Brooklyn Pierce and Bria Vinaite is what really sells the movie with their genuine chemistry, as well as their relationship with Willem Dafoe's character Bobby. This was another movie I had my eyes on thanks to its talented cast, and director Edgar Wright being at the helm. Baby Driver ended up being the fun fast paced film I was expecting, with some of the coolest characters and lines of dialogue I've seen in a long time. Everyone from the ensemble cast get their time to shine in this movie, including scene stealers like Lily James, Jon Hamm, and of course Jamie Foxx. I was entertained throughout by not only the characters and story, but also the beautiful way Wright shot the movie. Between the seamless scene transitions, colorful cinematography, and of course the way he incorporates the music for both the character of Baby and the audience is just amazing. Will I did feel the last act was a bit rushed and out of place by the time the credits role, that can't take away from the joy ride I was on throughout the bulk of this film. Who would've thought a movie based on the worst movie of all time would be so good. With the team involved with The Disaster Artist, including James and Dave Franco as the film's leads, this interpretation of the story of Tommy Wiseau was bound to be a success. With James' spot on impression of Wiseau, along with some great chemistry between the two brothers, the movie manages to do the impossible by humanizing Tommy. While the movie was just as funny as I thought it would be, what really surprised was how much heart it had. I really felt for these two guys just trying to make it in Hollywood, and the frustrations they were going through. I also loved how real the relationships between the characters felt, specifically how everyone reacts to Tommy's antics. Disaster Artist was definitely one of the most fun surprises of the year. Make a movie about a group of kids in the 80s, and I'm already there. I had a feeling It would try to hop off the success of Stranger Things, but it ended up making its mark as its completely own thing. The kids in this movie were just amazing, and all around had such unique and fun personalities brought to life so perfectly by the young stars. I'm honestly not a big fan of horror movies, but this movie honestly works more as an adventure movie. Unraveling the true horrors of this town outside of any thing supernatural, as well as the lure and history of Pennywise couldn't have been made more interesting. I honestly can't wait to see the adult versions of these characters take on that damn clown again in Chapter 2. I'm still crying after this one. Logan is one of those rare movies that honestly didn't even have to be based on a comic book, and would have stood on its own as a masterpiece. But the emotions are even higher having followed these characters for so many years, specifically James Howlett himself. I couldn't believe just how creative James Mangold got with this movie, between the world it takes place in and his vision of what a tragic future for mutants might be like. Logan and X-23's action sequences are truly remarkable, but where the movie really stands out is its character moments. The performances by new comer Dafne Keen, Jackman in his last turn as Wolverine, and a surprisingly gut wrenching performance by Patrick Stewart as an old sick Charles Xavier all feel so real that you forget they are superhuman characters. They finally just feel human. So which part of my list do you disagree with (I'm sure you do)? What are your top ten movies of the year? Let us know below!